Prominvest Bank is one of the Ukraine’s largest and most advanced banks, with 26 regional head offices, 262 branches and over 1,000 agencies and remote offices. In order to achieve this, Prominvest Bank required a sophisticated wide area network.The bank contracted Case Communications because of our proven track record of developing a wide range of networking technologies, and our ability to design a solution that combined and fully integrated both LAN and WAN networks. This gave the bank the a choice of access and infrastructure platforms for their wide area network and a comprehensive range of LAN products to provide the offices with access to the WAN. From this choice — provided entirely by Case Communications— Prominvest Bank had a solution designed for today’s need but scalable to tomorrow’s requirements. 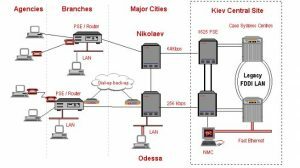 After a successful pilot network deployed between Odessa, Nikolaev and Kiev, Case Communications designed a backbone network using their multiprocessor X.25 nonstop packet-switching exchange at each of the 26 regional headquarters. Each X.25 switch supports up to 16 high performance processor cards which in turn are capable of supporting six ports and providing full packet-switching functionality. Case Communications Matchbox Routers with high levels of compression were installed to support the LANs at regional nodes and branches. This enabled all the branches to communicate with the regions and with the central site in Kiev. Every city node has at least two alternate routes to ensure no single loss of a circuit would prevent the a loss of service. Dial back up modems were also employed as further protection against loss of communication. The branches are connected to the regional nodes via leased line and modems. A Case Communications DomainView network management system, managing all X.25 and LAN products. Pad cards allowing the external services such as EPOS Terminal and ATM machines to access the network. The network is completely managed by a Case Communications DomainView graphical management system based in Kiev. The man-machine interface and operating system is the same for the management of the LAN and WAN, allowing for network operators to control both the wide and local area network products centrally.Case Communications expertise provided comprehensive and cost-effective project management and support at all times, ensuring smooth introduction and transition with no impact on any of the bank’s commercial activities. Ukraine’s communications infrastructure is continuing to improve, and digital services are increasingly prevalent. 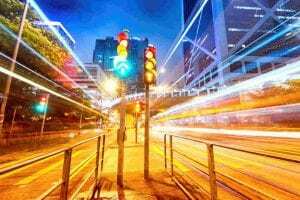 Case Communications’ network will provide higher speed links between sites, and will migrate to frame relay once the public service is in place. The bank will then be able to share voice, fax and data on a single converged network. All of the equipment supplied in the network is software configurable to run either frame relay or X.25, enabling a quick, easy and highly cost-effective migration to the newer technology. Case Communications is an information technology company specialising in networking products and solutions for the efficient integration of voice and data. We are a leading manufacturer of networking products in Europe. We have over 30 years experience in the design and manufacture of award-winning products, supplying advanced, cost-effective networks that provide reliable and effective solutions. Our track record means you can be sure Case Communications has the right network platform for a successful network solution. It is this proven success that ensured Case had a clear understanding of the Prominvest Bank’s needs in integrating the vast array of communications applications necessary to support the banking business.